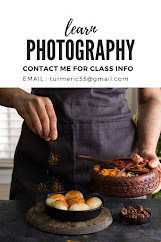 Turmeric n spice: Indian Rice Pudding/kheer, I was almost going to sell my camera. 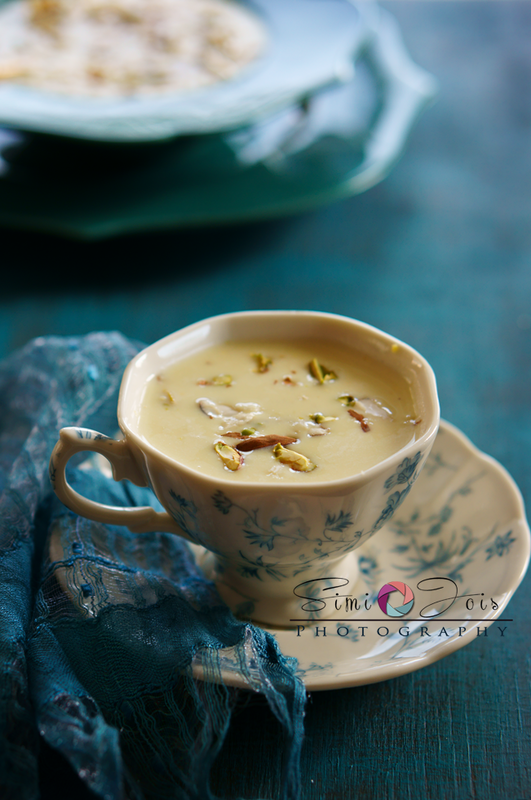 Indian Rice Pudding/kheer, I was almost going to sell my camera. If I have anyone to blame it is my friend Sophia. 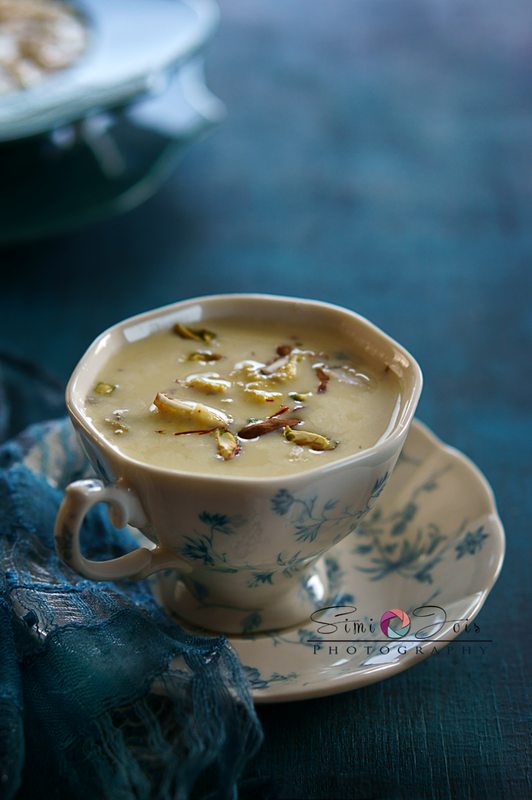 She started my obsession for rice-pudding, last week she shot an amazing (read bold) image of rice pudding. We started talking about rice pudding and realized there is so much common between our cultures and the symbolic meaning of rice, “ we also use rice as a symbol in our tradition (Bulgaria and Greece) and especially on weddings - symbolizes the pure virgin bride that is fertile to bear lots of healthy children and continue the generations of the family…” Rice in India is a symbol of Brahma, the creator and when you think of Brahma you think of purity and white, the use of rice in wedding as a symbol of prosperity and abundance is not new in our culture. We had Ilva join us in our madness. I don’t think I even need to introduce Ilva, she’s an amazing photographer and a great friend. She has taught me how to librate my art, not everything you see needs a critique ( I usually get over critical about my work) - enjoy what you create. That’s what I have learnt from her. …Three girls from three different cultures living in different countries as Ilva puts it, “We are all three expats, Sophia is Bulgarian but lives in Australia, Simi is Indian but lives in USA and I’m as you know Swedish and live in Italy” Three different rice pudding, a recipe that has been passed on to all of us. 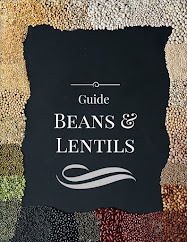 A thread that binds all humanity food and love. I hope you do enjoy our pudding as much as we enjoyed creating it. 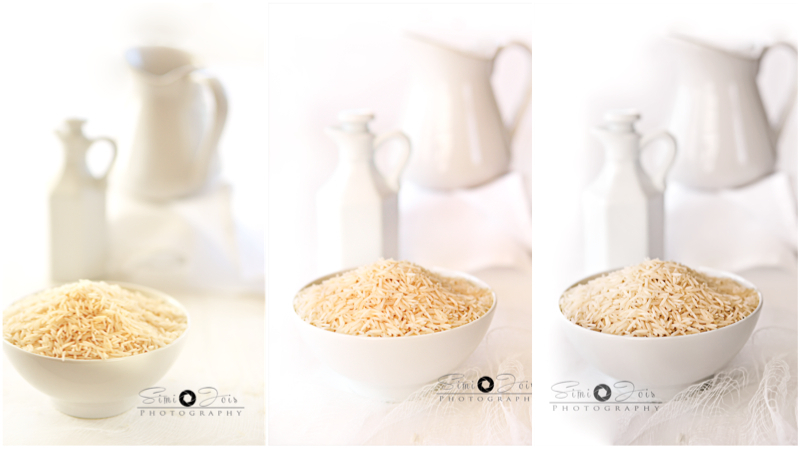 This post was a cause of a lot of heart burn, ( not from the rice pudding) I visualized the raw rice image as a white on white …little did I know what I was asking for. I would get a yellow overcast or a magenta refection and it was not pure white. Finally, after hours of reading on white balance and experimenting, I got the final image the way I visualized it. See the triptych and you will know what I am talking about. Who says white has no color, it’s one of the hardest things I have ever photographed. But loved the outcome. The thought of selling my camera did cross my mind when I was struggling to make this happen. You think things would have ended well with the white on white. Not really! It just got worse. I usually visualize my images a day before I shoot, but I think I was thinking am too good for that, watch what happened, I propped all the stuff, took pictures, re- arranged, took pictures, changed prop took pictures, changed direction of light took pictures, changed the complete color palette, took pictures….nothing worked. They were all dull, lifeless lack luster images. By now I had at least a hundred horrible pictures, since I cannot share hundred here, here are some better ones that were epic fail. (Click more to view). The last image of the first row, was not that bad and I thought it had hope and thankfully am able to post it. It took me eight hours to shoot this post. Was it worth it, every second of it. I think every family on this planet has their own version of rice pudding. Something mystical about milk and rice, boiled together on a slow flame…till magic happens. In India we have a few hundred versions of this and I am no expert on rice pudding, I just know how my mother makes it. 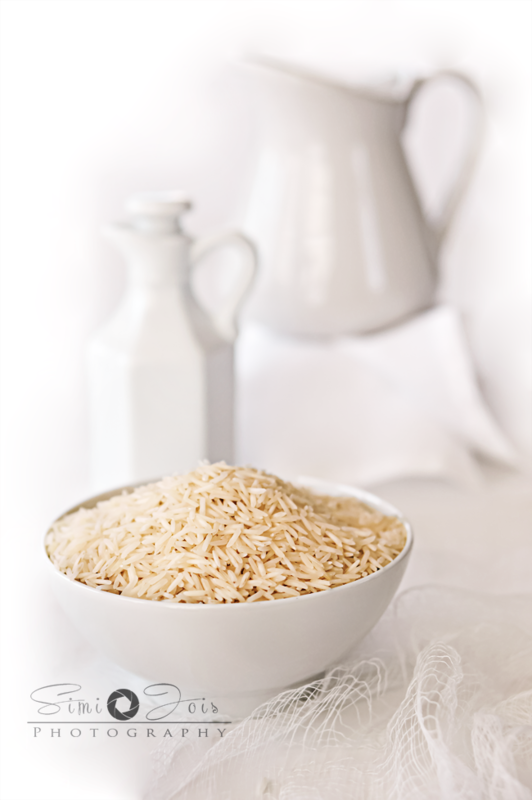 Long grain aromatic basmati, on a slow flame with a generous helping of saffron. Rice cooked till it melts in your mouth but still al dente, flavor of saffron and the beautiful yellow golden hue. I heard rice-pudding is back in vogue and is being served as a delicacy, I wonder was it ever out of vogue. I am not the one to follow trends, so how would I know. 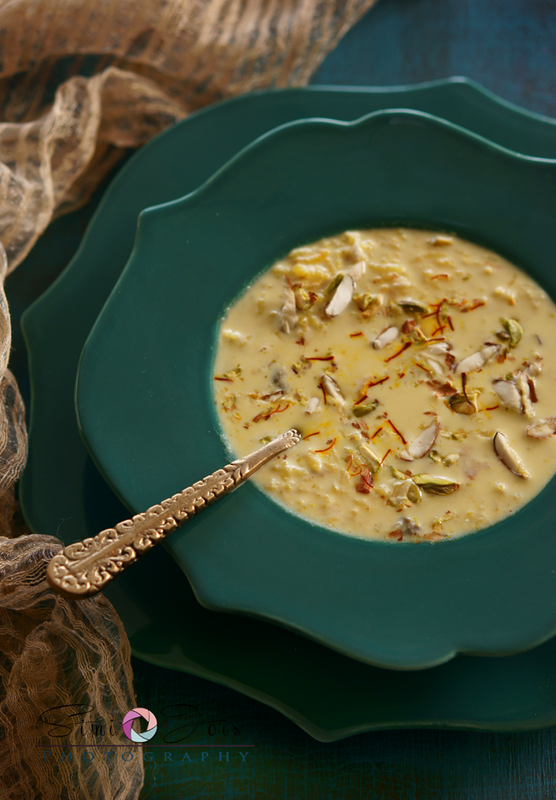 Roast the basmati in ghee, add milk & saffron, let it simmer on low flame for about an hour. Keep string it to make sure the milk is not burning ( if it does, there is really no rescue, there is nothing worse than the smell of burnt kheer). It should reduce to a thick creamy consistency, almost half of the original volume. Check if the rice is soft but yet al dente. Add sugar, cardamom and roasted dry fruits. You can serve it hot or chilled. For slow cooker : increase the cook time to two hours, add the sugar, dry fruits and cardamom after the rice is cooked, wait till the sugar dissolves. If you make this in a slow cooker the color is a bit yellowish brown. 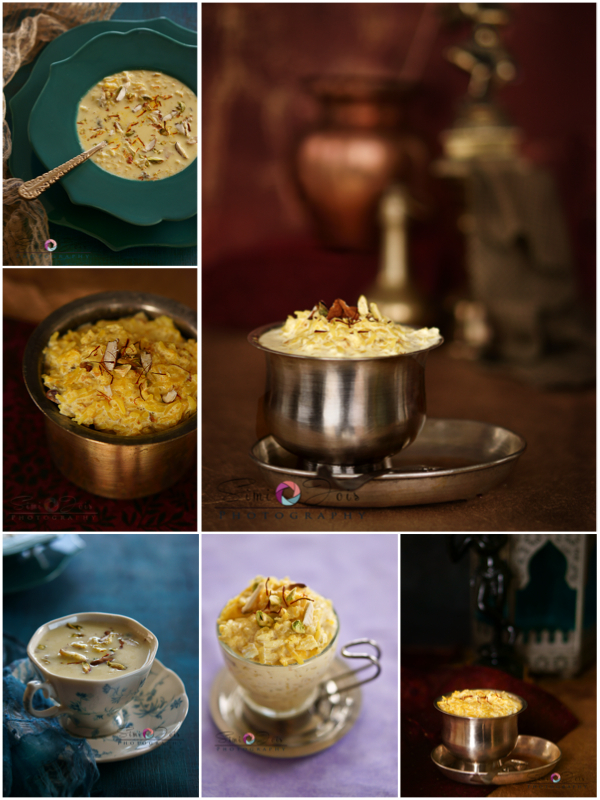 Lovely shots (especially the picture of the rice) and delightful rice pudding! 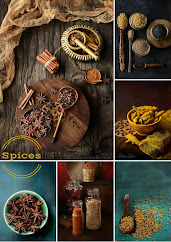 Am a great fan of your photography dear :) Lovely composition , and wonderful use of props .. Love the rice pic with all white :) pudding looks super tempting !! Your rice pudding pictures are a work of art.One can see that really revere not only making rice pudding but also making a stunning presentation.Entrancing elegant and exquisite - I wish I could my hands on a bowlful. Beautiful shots of the pudding. 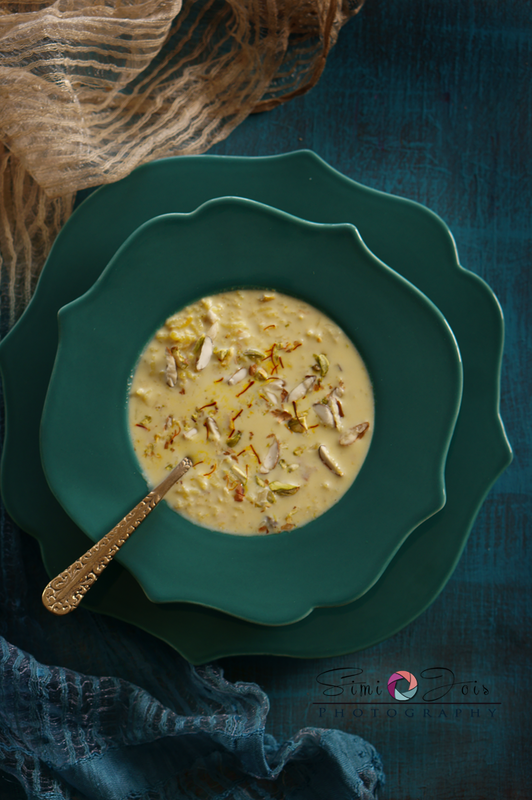 I crave Indian rice pudding----I am not just saying that to be saying it. Its a from the heart statement. So needless to say I enjoyed the post, the photos and the recipe.